A Catholic bishop in the Central African Republic (CAR) has given refuge to 2,000 Muslims who are living in fear of attacks from a mainly Christian militia. Juan José Aguirre Munoz says that the refugees cannot leave the seminary's compound in the south-eastern city of Bangassou. He told the BBC that the refugees "risk death" from anti-balaka militias. The UN's humanitarian chief warned last week of possible genocide. 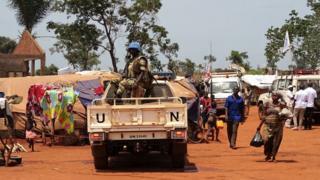 Stephen O'Brien said that violence in CAR was escalating and the situation was becoming dire. "Violence is intensifying, risking a repeat of the devastating destructive crisis that gripped the country four years ago," he said. Mr O'Brien added: "The early warning signs of genocide are there. We must act now." CAR has experienced sectarian violence since 2013, when the largely Muslim Seleka rebels seized power, and were accused of killing non-Muslim civilians. The anti-balaka "self-defence" groups were then formed but have also been accused of atrocities. Balaka is a street name which means bullets and the militia's name therefore translates to "those who stop bullets". Seleka, on the other hand, means "coalition" in the widely-spoken Sango language. According to the UN, thousands have been killed and at least a million people have been displaced in CAR since 2013. It also says that at least half of the population is dependent on humanitarian aid. A tenuous peace deal signed in June saw 13 out of 14 armed groups operating in the country agree with the government to end fighting in exchange for political representation and the integration of armed militias into the military. Bishop Munoz says that the refugees sought help at the seminary after fighting broke out in May, and have since been under the care of the church and aid organisations. "Nearby, there are anti-Balaka militias who prevent them from going out to search for food, water or firewood," he said. "So they are completely confined inside the seminary. They would risk death if they venture out," he told the BBC's Newsday programme. A 10-year-old boy who was caught up in the violent clashes told a Médecins Sans Frontières (MSF) aid worker that he was shot at. "People fired shots. One of my brothers received a bullet in his heart. Another brother got a bullet in his chest. I also received one in my testicle," he said. A doctor with MSF, Ernest Lualuali Ibongu, told the BBC that there are other people in the seminary who need medical care but who cannot leave the compound to get to a hospital. Bishop Munoz said that the refugees needed to be relocated because many aid organisations have stopped working in the area. He said that attempts to appeal to the militia to allow aid workers in had failed. "The anti-Balaka are armed and very violent and capable of killing children," he said. "It is very difficult to reason with [them]." He says that both anti-Balaka and Seleka militias have attacked the church's properties, but adds that it is determined to protect vulnerable people from both sides. "For us, there's no such thing as a Muslim person or a Christian person, everyone is a human being. We need to protect those who are vulnerable." Correction 2 September 2017: An earlier version of this story carried an image of milita in Gambo (taken by Alexis Huguet, AFP/Getty) which we incorrectly captioned as being militia camped outside the seminary in Bangassou. Why have one in four fled their homes in CAR?